This page is to primarily to provide notices or any other club information which has changed or become available since the last Club Newsletter. New information is added at the top, older items are generally retained below. - 15th May - Lunch in Portimao - Now fully booked. - 4-8 November - 5-day Coach Trip - Now fully booked. Bookings for the above can be made now via any Committee Member or use the contact page. We expect to be staying just outside Cadiz for four nights in November. Altough some details are still somewhat 'fluid' all available seats on the coach are now booked. We are maintaining a 'reserve list' in case of any cancellations. As no other requests were received at the AGM we have again made a donation to the Castelo do Sonhos "Back To School" Project (see 2017 item below for more information). 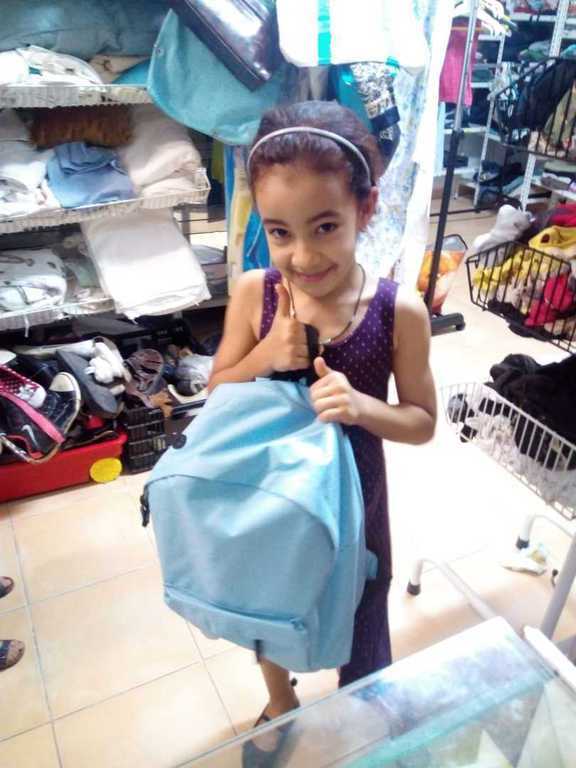 According to a 2018 survey the average annual cost to families of one childs school supplies is now €487, beyond the reach of poorer families. (See pages 18 and 20 of the 25 August 2018 edition of The Portugal News for more information). With the money kindly donated by attendees at the annual CASA BBQ at the Holiday Inn we have been able to purchase 20 teenager back packs and assorted stationery items. These were delivered to the charity on 30th August where they were addded to 30 other backpacks and 50 gymbags etc. donated via various organisations. The photo below shows Lena Reitbergen from the CASA committee with Dra. Liliana Rodriques who runs Castelo do Sonhos. Behind Liliana is Sue Butler-Cole who provides invaluable assistance to Castelo do Sonhos by interfacing with ACCA and other clubs and organisations. 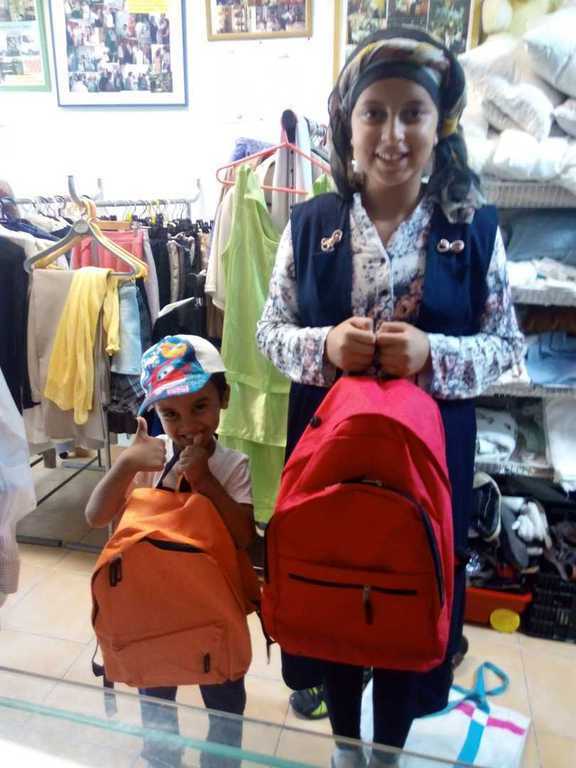 We would also like to thank ‘The Golf Shack’ who kindly supplied the backpacks at a discounted price as their own contribution to the “Back to School” project. The 50 filled backpacks collected via A.C.C.A. 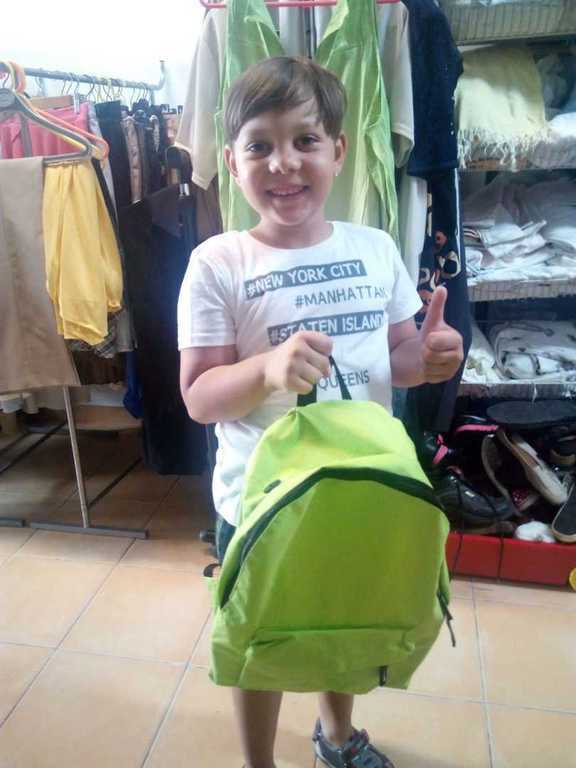 (including the 20 from CASA) have been delivered to Castelo do Sonhos and they started handing them out to the schoolchildren on 10th September. On May 25, 2018, a new European Union (EU) data protection law, the 'General Data Protection Regulation' (or GDPR), took effect. The GDPR gives all individuals resident in the EU more control over how their data is used and places certain obligations on all organisations that collect, hold or process information of those individuals. Please see the last item on the 'Legal' page if you require more information. At the 2017 AGM there were no proposals made for donations to charity this year. 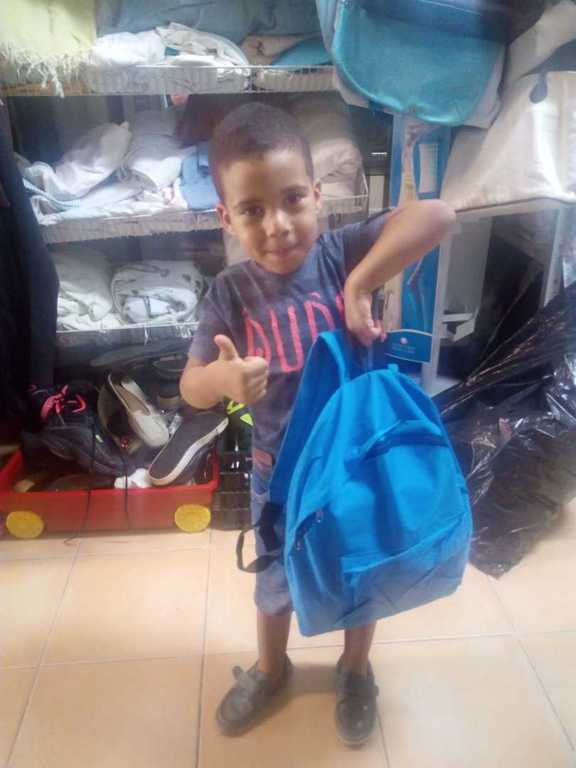 The committee was recently aproached by member Sue Buter-Cole on behalf of Castelo do Sonhos, the Silves based childrens charity, in respect of their annual “Back To School” project. Whilst the Portuguese state provides free schooling with staff, text books etc. it does not provide the 'consumables' such as notepads, pencils etc. that children need. This must be supplied by their families and for the poorer families this can be a significant problem and many children start school after the summer holiday without these items. 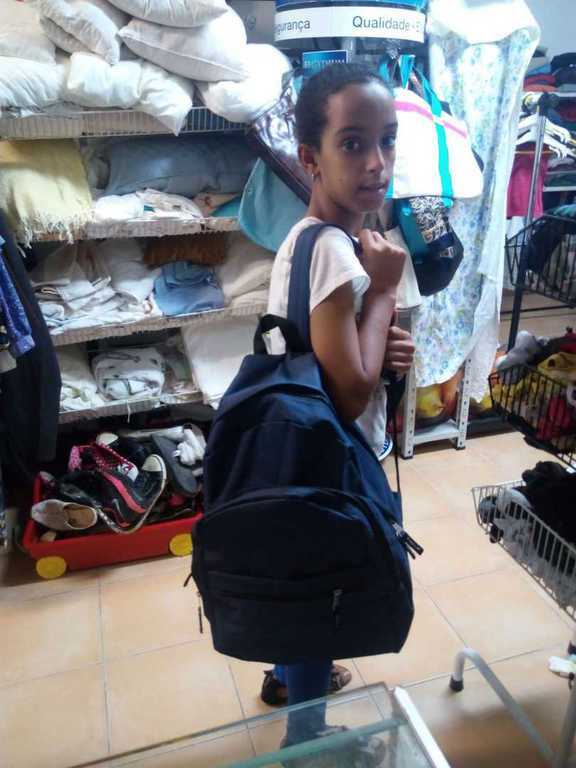 The Back To School Project was originally started by Castelo de Sonhos for the poor children in the Silves area and for many years Celia & Dave Mossman (who have since returned to the UK) were the main organizers. 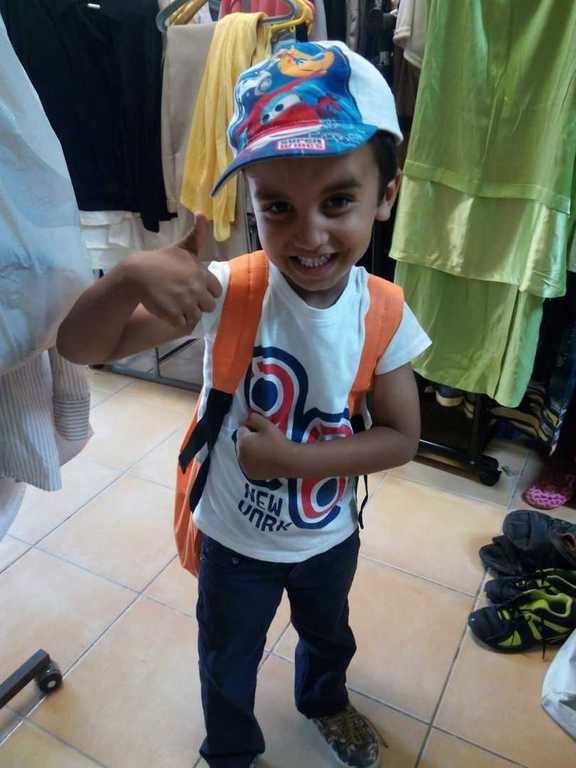 When ACCA (the children's charity from Almancil) became involved the project just grew & grew. 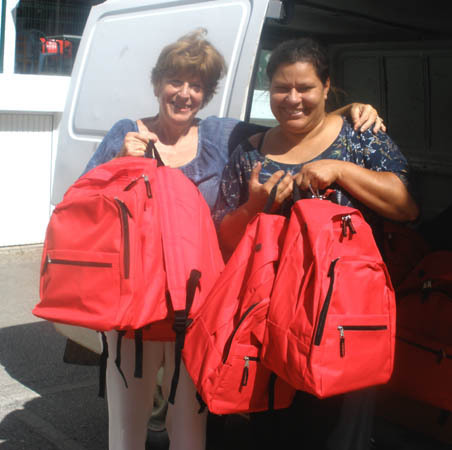 This year  ACCA have donated 50 (empty) backpacks to Castelo de Sonhos who now need to fill them. C.A.S.A. purchased and donated €100 worth of these materials for distribution in the ACCA backpacks. The photo below shows C.A.S.A. Chairman Margaret Brito presenting the purchased materials to Liliana Rodriques who runs Castelo do Sonhos. Following difficulties with sending e-mails to some members early in 2017, now resolved, we have made improvements to the security of this website and to club e-mails. This should not impact your use of the site. If you do experience problems please contact us using the contact page or the contact information in the latest Club Newsletter. From 5th June 2017 when you access this site you should always see the 'locked padlock' symbol to the left of your browser address bar. This indicates that the communication between your browser and the web-site is encrypted by using the 'HTTPS' communications protocol so that the contents can not be seen or interfered with by any third party. As was arranged at the 2016 AGM two charitable donations were made during the summer of 2016, the larger being to the Bombeiros who carried out sterling work over the 2016 summer. In response to the proposal by Do Eves at the AGM the sum of €160 has been donated to this charity and used by them to purchase food supplies for the coming term. This is a very worthy cause that helps local over 18 year olds with mental disability. The money represents the value of 'vouchers' issued to members during the last 12 months but not used. As the Bombeiros have been very busy recently doing a superb and vital job it has proved a little difficult to arrange the presentation. This was finally completed on Wednesday 24th August. Portimao Bombeiros have used the €1,500 donation to purchase 160 new 'BOMBEIROS' red sweat-shirts as modelled by the two gentlemen on the left and right of the photo below. The cheque was presented to Dr. João Nuno de Figueiredo Mergulhão (Vice President) by Margaret Brito (Chairman of CASA Social Club) assisted by João Brito acting as the Portuguese interpreter for the club. These exceptionally brave men and women work relentlessly, day and night, to keep us all safe. The fires this year again tested them to the extremes, but they consistently rise to the dangerous challenge and we owe them our infinite gratitude. Effective from the 2016 AGM we have changed the club bank account, if you need to make any payment by cheque or bank transfer (eg Multibanco) please obtain the new details from the treasurer first. The bank charges the club for handling any payments made to the old account!